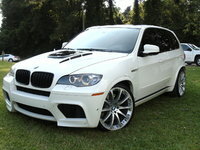 CarGurus has 282 nationwide X5 M listings starting at $15,899. Want a semi-tough sport ute that’ll get you back and forth from the antique store or the polo match in record time, while as you sit surrounded by plush appointments? Check out BMW’s performance-oriented 2015 X5 M midsize 5-door, 5-passenger luxury SUV. After a year off, the next-gen X5 M loads all kinds of M-designated performance gear and design features aboard the regular X5 platform. Additionally, despite being only average compared to this high-end hauler’s rivals, some 75.2 cubic feet of cargo space, (with the rear seatbacks folded) should nevertheless be sufficient for toting a good number of purchases back to the house. Not to mention, intelligent all-wheel drive (iAWD) is once again standard. Again available in only a single Base trim, the 2015 X5 M sports a number of distinctive styling cues that set it apart from its more pedestrian X5 brethren. These profile perks include a set of front air dams that have been enlarged and improved for this year, a sport-tuned suspension, distinctive wheels with performance tires, quad exhaust pipes, M-style outside mirrors, brake vents behind the front wheels, and a roof rack. Perhaps the most significant upgrade for the 2015 version of this high-end hauler is a new 8-speed shiftable automatic transmission (tweaked to M specs) that now manages the up-powered-for-2015 4.4-liter twin-turbocharged V8 engine. Despite boasting an additional 12 ponies (567 total hp) and 53 lb-ft more torque (553 total lb-ft), this reworked drivetrain is touted by BMW as being 20% more fuel efficient thanks to this new transmission. Additionally, the 8-speed automatic comes with steering-wheel-mounted paddle shifters, not to mention Launch Control that’s complemented by a selectable Sport setting. Fuel economy figures for the latest X5 M are unavailable, but if you can afford this screamer, chances are that gas mileage won’t be a huge concern. Further optional performance goodies, by the way, include settings for the adaptable suspension, mode-and-mood tweaks for throttle response and the new-for-2015 electric power steering system, and some fine-tuning of shift points in manual-shift mode. Some added upgrades for the 2015 X5 M also include a couple of new exterior colors, Long Beach Blue Metallic and Donington Gray Metallic, while the cabin sports a number of upgrades to accent materials, as well as a new-look standard navigation system. Standard exterior bells and whistles, meantime, include newly reworked 21-inch alloy wheels with performance tires, a power sunroof, power-adjustable reverse-tilt mirrors, a power liftgate, and trailer wiring. Inside, look for premium leather upholstery, heated power-adjustable front seats, full power accessories, cruise control and telescoping tilt-wheel steering. Additionally, a remote garage-door-opener also comes standard, as do front and rear parking sensors, a rear-view camera, and 4-zone auto climate control. Memory for driver’s settings also returns, as does an auto-dimming rear-view mirror. Techno-bling includes Bluetooth-interfaced BMW Assist directions and connections technology supporting mobile WiFi capability and smartphone apps, along with the upgraded GPS navigation, and a 600-watt Harman Kardon stereo that sports a single-CD player, 16 speakers, and satellite radio. Optional equipment, meanwhile, includes the Executive Package, featuring LED headlights, soft-close doors, heated rear seats, a heated steering wheel, ventilated front seats, and concierge service added to the standard directions and connections feature. Standalone options include rear-seat DVD entertainment, upgraded 20-inch alloy wheels, enhanced Bluetooth capabilities and a 1,200-watt Bang & Olufsen audio system with 16 Surround Sound speakers. Standard safety equipment aboard the 2015 X5 M, finally, includes 4-wheel antilock brakes (ABS), front side-mounted airbags, front and rear head airbags, daytime running lights, front fog/driving lights (LED available), and turn-signal-integrated mirrors. Further standard safety stuff includes high-intensity-discharge (HID) headlights, a post-collision safety system and a remote antitheft alarm. Optional safety stuff, furthermore, includes the Driver Assistance Plus package, with adaptive cruise control, blind-spot monitoring, top and side cameras, and speed-limit information, along with such standalone available safety bling as Parking Assist, a head-up display, and night-vision with Pedestrian Detection. 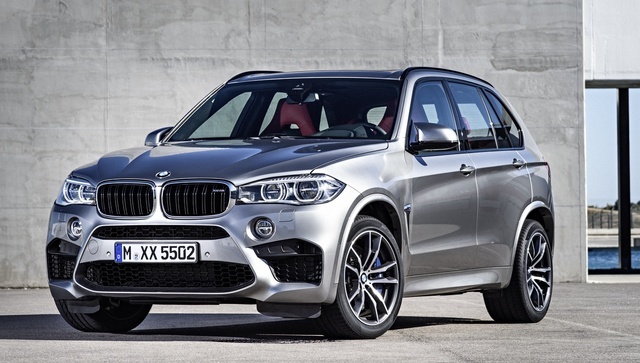 What's your take on the 2015 BMW X5 M? 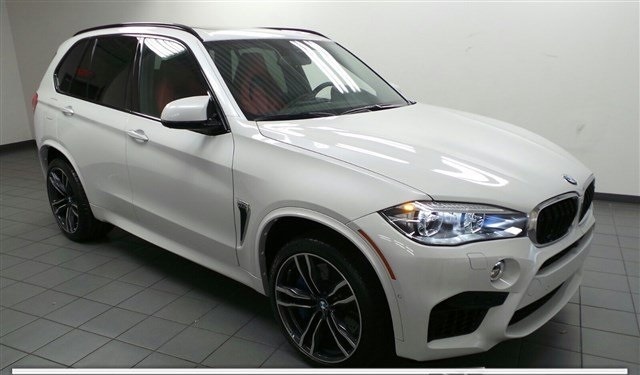 Have you driven a 2015 BMW X5 M?